Ht / Wt: 6'3" / 232 lb. 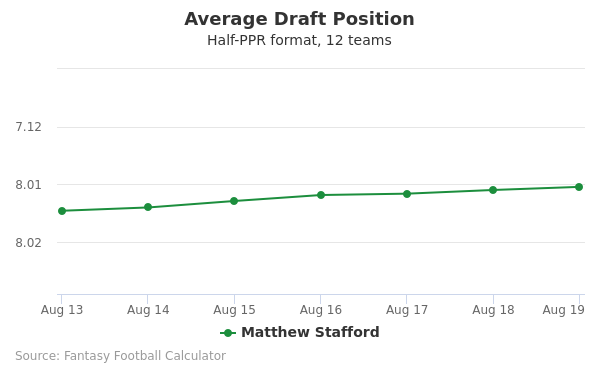 Matthew Stafford's fantasy value is measured by his average draft position (ADP) in fantasy football mock drafts. 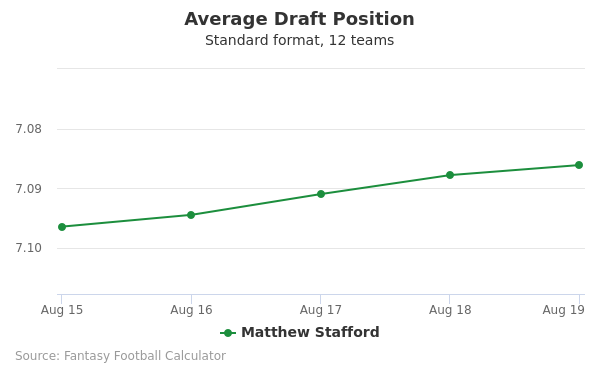 In recent drafts, Stafford's current ADP is 14.08, which indicates that his fantasy outlook is to be the 8th pick of the 14th round, and 163rd selection overall. 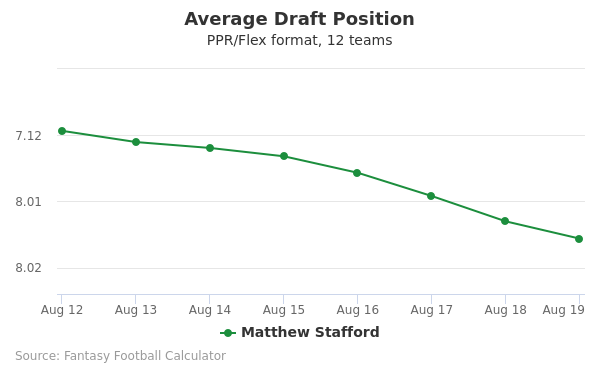 The code below will display a graph that updates every day to show the ADP data for Matthew Stafford for the past 30 days in 12-team PPR leagues. Draft Matthew Stafford or Nick Foles? Draft Jalen Richard or Matthew Stafford? Draft Matthew Stafford or Sam Darnold? Draft AJ Brown or Matthew Stafford? Draft Jack Doyle or Matthew Stafford? Draft Matthew Stafford or Nelson Agholor? Draft Indianapolis Defense or Matthew Stafford? Draft Matthew Stafford or Philadelphia Defense? Draft Matthew Stafford or Robbie Gould? Draft Matthew Stafford or Noah Fant? Draft Damien Harris or Matthew Stafford? Draft Jamison Crowder or Matthew Stafford? Draft Buffalo Defense or Matthew Stafford? Draft Adam Vinatieri or Matthew Stafford? Draft Brett Maher or Matthew Stafford? Draft Matthew Stafford or Seattle Defense? Draft Matthew Stafford or New Orleans Defense? Draft Matthew Stafford or N'Keal Harry? Draft Matthew Stafford or Ryan Fitzpatrick? Draft Matthew Stafford or Stephen Gostkowski? Draft Matt Prater or Matthew Stafford? Draft Jake Elliott or Matthew Stafford? Draft Aldrick Rosas or Matthew Stafford? Draft Jason Myers or Matthew Stafford? Draft Mason Crosby or Matthew Stafford? Start Matthew Stafford or Nick Foles? Start Jalen Richard or Matthew Stafford? Start Matthew Stafford or Sam Darnold? Start AJ Brown or Matthew Stafford? Start Jack Doyle or Matthew Stafford? Start Matthew Stafford or Nelson Agholor? Start Indianapolis Defense or Matthew Stafford? Start Matthew Stafford or Philadelphia Defense? Start Matthew Stafford or Robbie Gould? Start Matthew Stafford or Noah Fant? Start Damien Harris or Matthew Stafford? Start Jamison Crowder or Matthew Stafford? Start Buffalo Defense or Matthew Stafford? Start Adam Vinatieri or Matthew Stafford? Start Brett Maher or Matthew Stafford? Start Matthew Stafford or Seattle Defense? Start Matthew Stafford or New Orleans Defense? Start Matthew Stafford or N'Keal Harry? Start Matthew Stafford or Ryan Fitzpatrick? Start Matthew Stafford or Stephen Gostkowski? Start Matt Prater or Matthew Stafford? Start Jake Elliott or Matthew Stafford? Start Aldrick Rosas or Matthew Stafford? Start Jason Myers or Matthew Stafford? Start Mason Crosby or Matthew Stafford? Matthew Stafford is currently the starting quarterback for the Detroit Lions. He started his career in high school at Highland Park High School. In 2005, his team posted a 15-0 record and won a state championship. That season saw him throw for over 4,000 yards and he was often listed as the No. 1 pro-style quarterback prospect in his graduating class of 2006. The hype around him was so high that he was correctly predicted to be picked No. 1 in the NFL Draft. Stafford's high school career led to be him being highly recruited and ending up at University of Georgia in 2008. His freshman year saw him play in 13 games, completing 135 passes for an average of 6.8 yards per pass while throwing seven touchdowns. As a sophomore, he completed 194 out of 348 passes. More importantly, he cut his interceptions down to 10 while throwing for 19 touchdowns for 2,523 yards. In his junior year, he had 235 completions for an average of nine yards, throwing 25 touchdowns and 10 interceptions and 3,459 yards. After that impressive season, he went straight into the draft. View his highlights. Stafford came into the NFL Combine as one of the most highly sought-after quarterbacks in the draft. His performance in the combine was respectable, without being outstanding. His 40 time was 4.81 seconds, his vertical 30.5 inches, his broad jump 107 inches, his three-cone drill time 7.06 seconds, and his 20-yard shuffle 4.47. Stafford was selected, as many predicted, at No. 1 by the long-suffering Lions, who had the ignominy of posting the first 0-16 record in league history the season before. When signed to a six-year contract, he was given a $41.7 million guaranteed salary (a then-record) and started his rookie season with high expectations. Stafford's career with the Lions has been filled with ups and downs. His first season they went 2-14, though he was out for six. He had 201 completions for 2,267 yards and 13 touchdowns while throwing 20 interceptions. The next season was a loss for Stafford, who was injured for all but three, going 1-2 in a 6-10 season. He threw just 535 yards, six touchdowns, and one interception. His 2011 season is consistently ranked in the top 10 seasons of all quarterbacks of all time. With a completion rate of 63.5 percent, he had 421 caught passes for 5,038 yards (a career-best and a stat that makes him just the fourth quarterback in history to reach 5,000 yards in a season), 41 touchdowns, and 16 interceptions. The Lions posted a 10-6 record and made it to the playoffs for the first time since 1999. 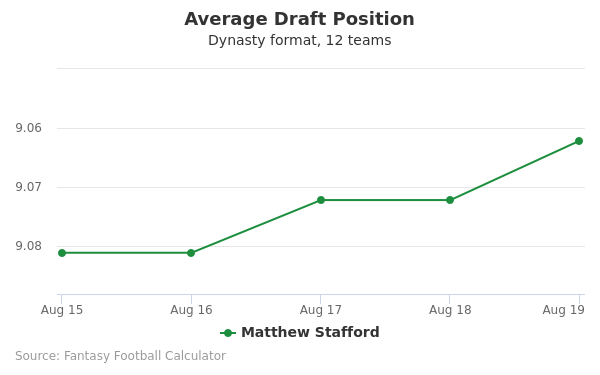 The next year saw a downturn as Stafford went 4-12 while posting a career-high 435 receptions. His yardage dropped to 4,967 on the season, while he had just 20 touchdowns to 17 interceptions. 2013 saw an increase to a 7-9 record with 371 receptions, 4,650 yards, 29 touchdowns, and 19 interceptions. In 2014, the Lions posted their best record with Stafford at 11-5. He had 363 caught passes for 4,257 yards, 22 touchdowns, and a then career-low of 12 interceptions. He had another solid year in 2015, with a 7-9 record. His 398 receptions were good for 4,262 yards, 32 touchdowns, and just 13 interceptions. His 2016 season was very strange. The Lions started out 1-4 and proceeded to win eight-of-nine games, seven of which were come-from-behind in the fourth quarter. Stafford's eight come-from-behind wins are an NFL record, his total wins in that category an NFL record. View his highlights. Stafford married his college sweetheart and is expecting identical twin girls in the future. His Twitter account hasn't been updated since 2011, though he does host a weekly show with Mitch Albom in Detroit.